This panoramic view from the International Space Station, looking past the docked shuttle Atlantis' cargo bay and part of the station including a solar array panel toward Earth, was taken on July 14, 2011 as the spacecraft passed over the Southern Hemisphere. Aurora Australis or the Southern Lights can be seen on Earth's horizon and a number of stars are visible also. NASA's shuttle Atlantis and the eerie green glow of the Southern Lights serve as a dazzling sight in a new photo snapped by astronauts from the International Space Station. The photo was taken Thursday (July 14) by an astronaut on the space station during NASA's final shuttle mission, the STS-135 flight of Atlantis. "Aurora Australis or the Southern Lights can be seen on Earth's horizon and a number of stars are visible also," NASA officials said in a photo description. The image's long exposure led to streaks in Earth's clouds, giving it a sense of speed. The southern lights, like their northern counterpart the northern lights, are auroras created by charged particles from the sun's solar wind interacting with Earth's atmosphere. The particles are funneled to the polar regions of Earth by the magnetic field, then emit brief flashes of light as they meet the atmosphere. One of the STS-135 Atlantis crewmembers took this photo of the Southern Lights or Aurora Australis while visiting the International Space Station on July 14, 2011. Part of the orbiter boom sensor system (OBSS) is seen, as it was attached on the end of the shuttle's robotic arm (out of frame). A part of the port side wing of the shuttle is at right and a solar panel for the station is at left edge. 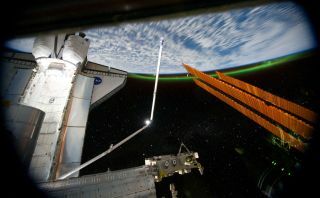 Astronauts on the space station and shuttle Atlantis also captured other amazing aurora photos on Thursday. In the series of aurora photos from the station, the ever-changing nature of Earth's auroras is evident as the southern lights shift from image to image. The space station is currently home to 10 astronauts made up of the orbiting lab's core six-man crew and the four visiting astronauts from shuttle Atlantis. The Atlantis crew is midway through a 13-day mission to deliver tons of vital supplies and equipment to the International Space Station. Atlantis' STS-135 mission is NASA's final space shuttle flight. After this mission, NASA will retire the shuttle fleet to end the 30-year program in order to proceed with a new program aimed at deep space exploration. You can follow SPACE.com Managing Editor Tariq Malik on Twitter @tariqjmalik. Visit SPACE.com for complete coverage of Atlantis' final mission STS-135 or follow us @Spacedotcom and Facebook.